Note: All intellectual works represented here are considered copyrighted © by the noted authors. 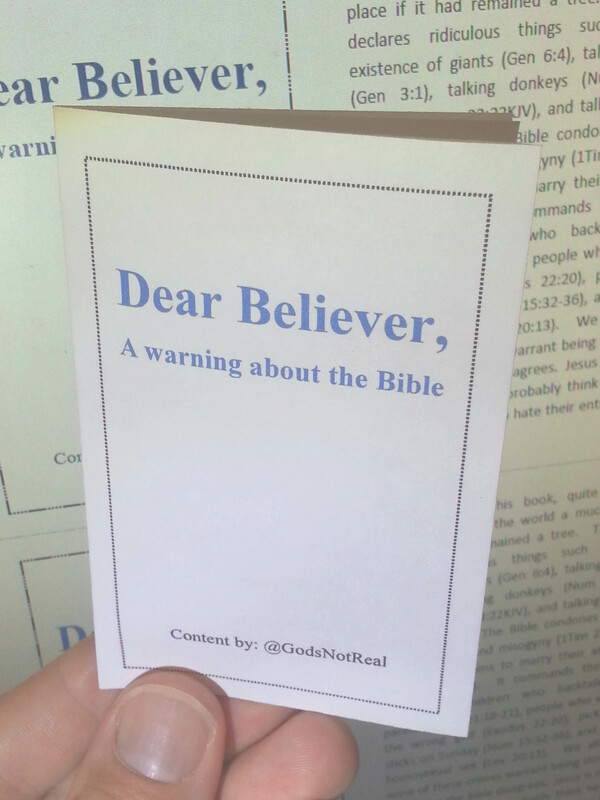 Dear believer a warning about the Bible (Pic) (Mini-Pamphlet: How to fold) … A brief but harsh listing of immoralities and absurdities, with content designed for those opening a bible, but can be used anywhere. Content submitted by @GodsNotReal_ on twitter. 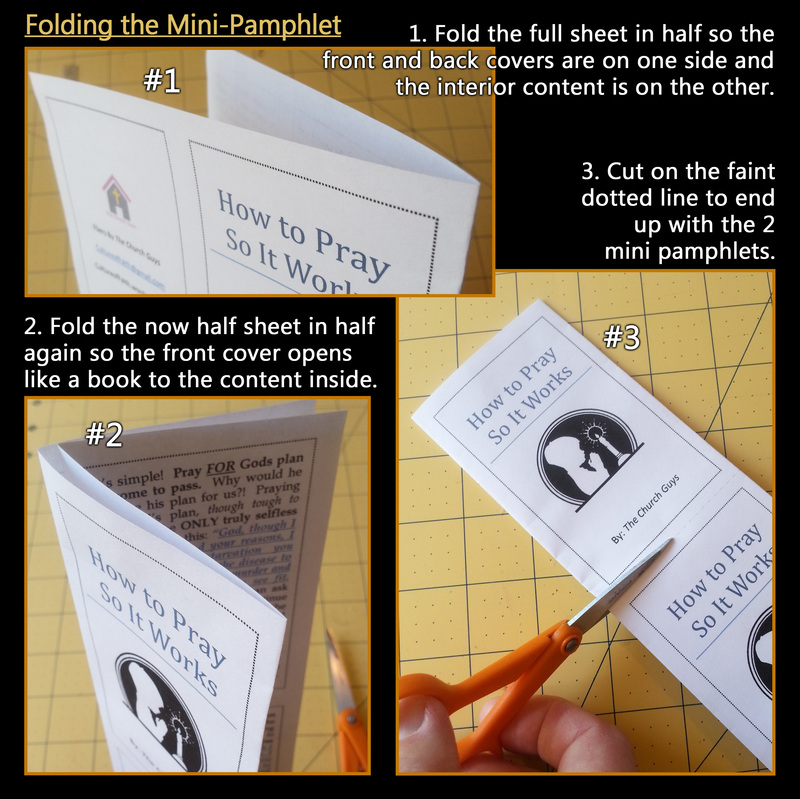 Strength of the Christian Mind BOOKMARK (PIC) (5 per page UNDERCOVER bookmark), It showers praise for still believing despite the horrors of God… Trying to inspire them to think again. 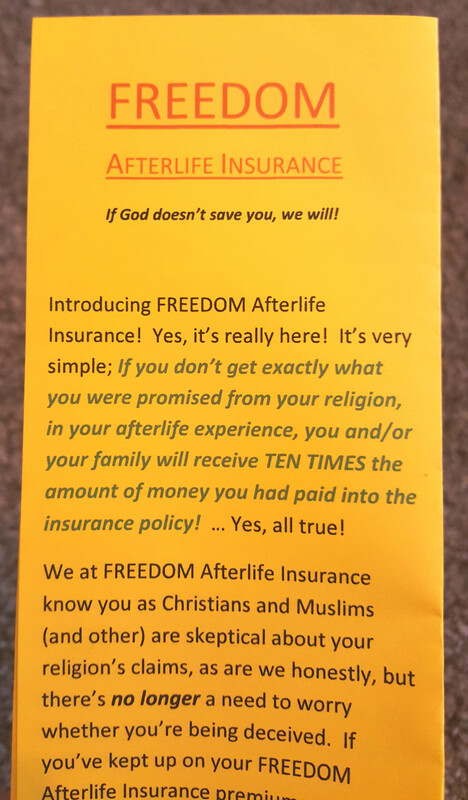 NEW!… “FREEDOM Afterlife Insurance – If God doesn’t save you, we will!” One sided Tri-fold, (pic) < A fairly obvious fake meant to point out the folly of buying into religion. 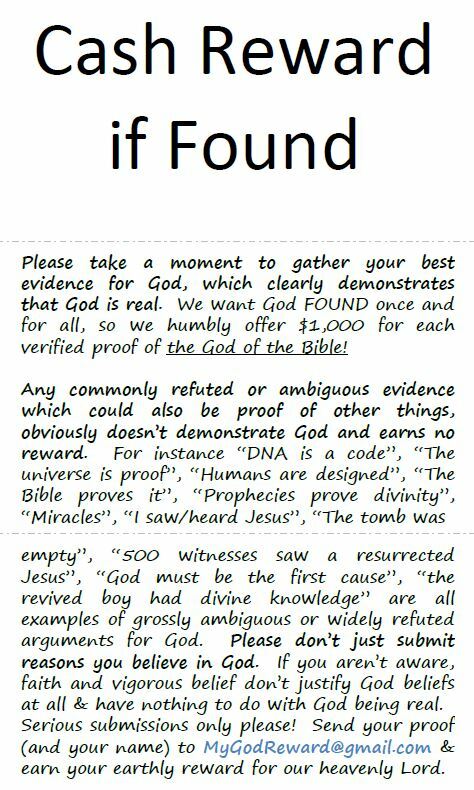 “Cash Reward if Found” Tiny Pamphlet (pic) ,… A drop anywhere attention grabber pamphlet (Fold like this),.. “Cash Reward if Found” with PULL TABS (pic) Both versions refer to “finding” God and submitting evidence for his existence and getting a cash reward. 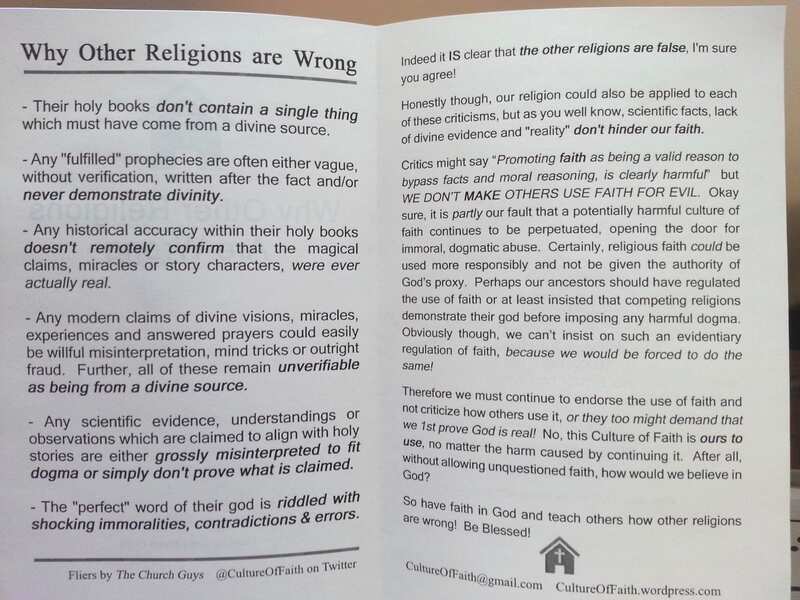 Why other religions are wrong, (Simple Bi-fold) CONTENT HERE … COVER HERE, (PIC) It points out the obvious failings of other religions, then qualifies Christianity too. *** NEW – MISSING! 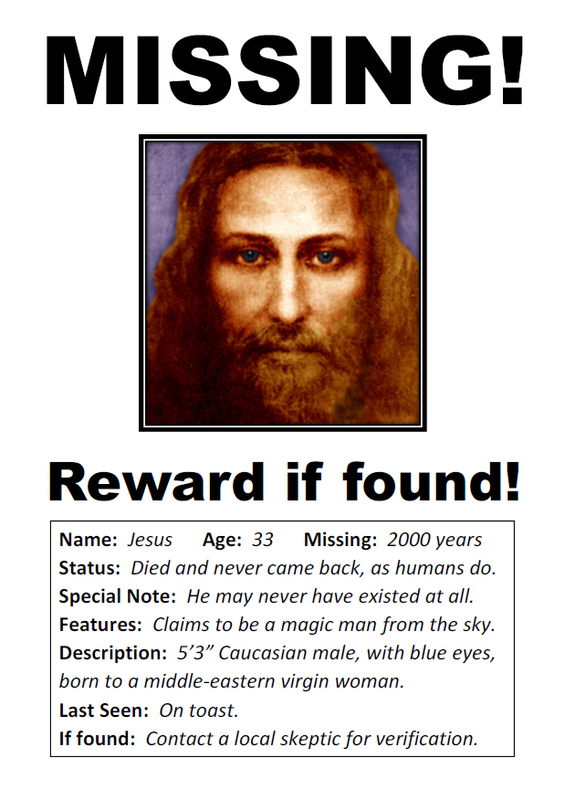 Reward if found (Jesus) (pic) A simple flier you might post for a missing pet. 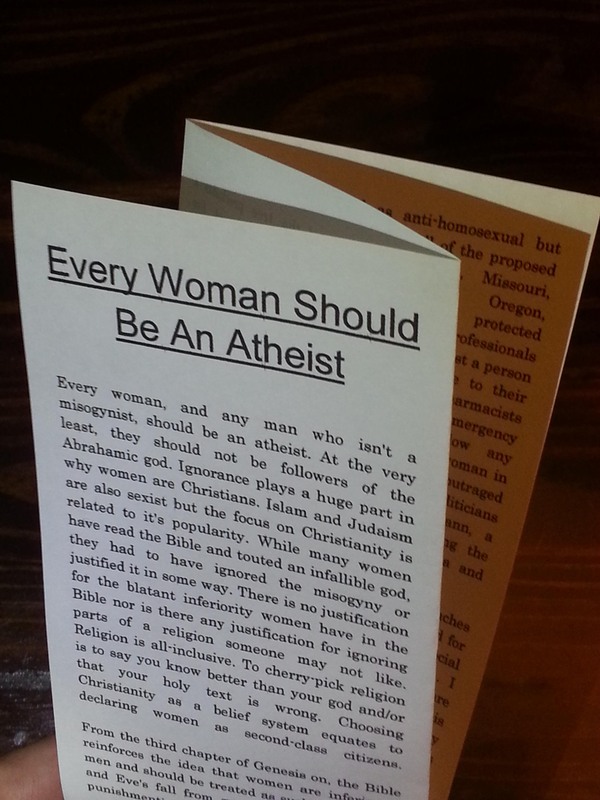 Atheist Patches (anti religion graphics) which can be printed as fliers or stickers. Click here! 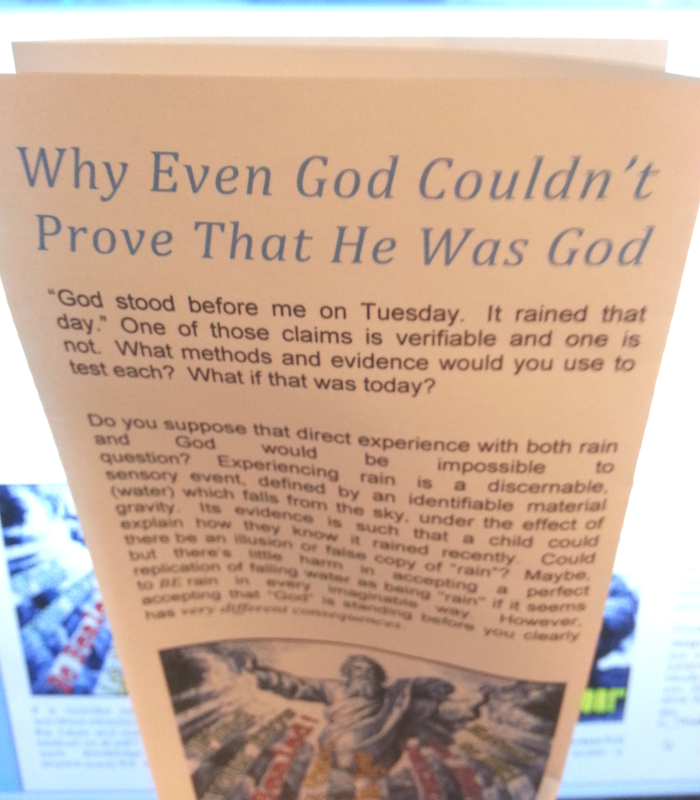 Why Even God Couldn’t Prove That He Was God (pic) (accordion style tri-fold) Detailing a scenario where God is before us, but we still can’t know if he is who he claims to be. When Should Christians Authenticate Commands From God? 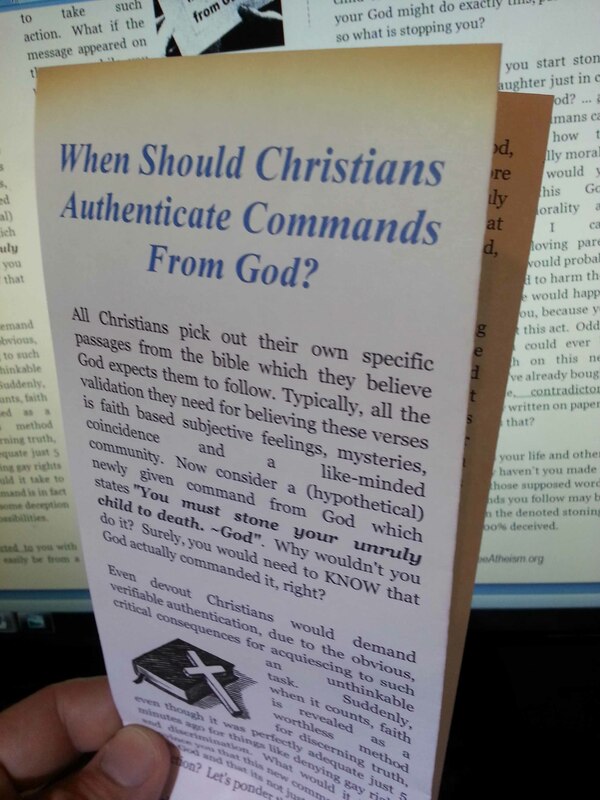 (pic) (accordion style tri-fold) Showing how a new command from God would leave believers insisting on authentication from god first, proving faith worthless. 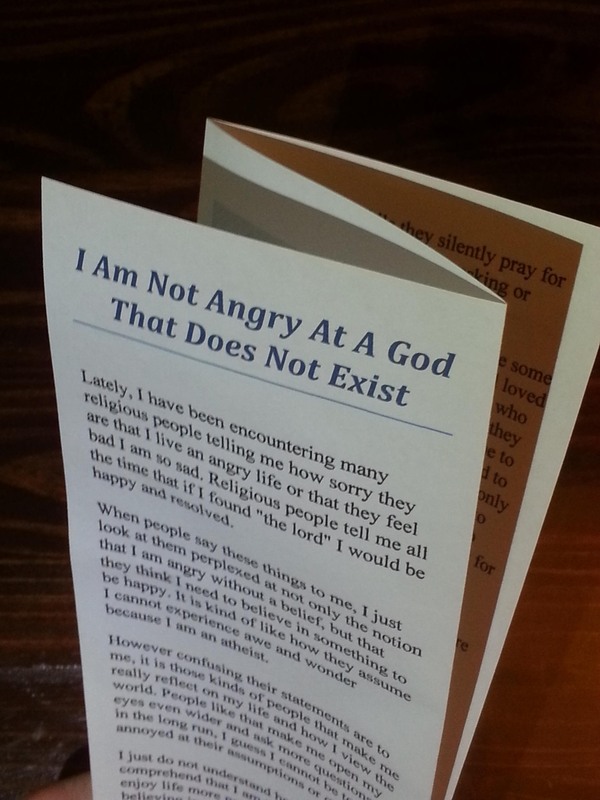 Celebrating this amazing life (Mini-pamphlet) We are connected to and a part of this universe, not Gods. 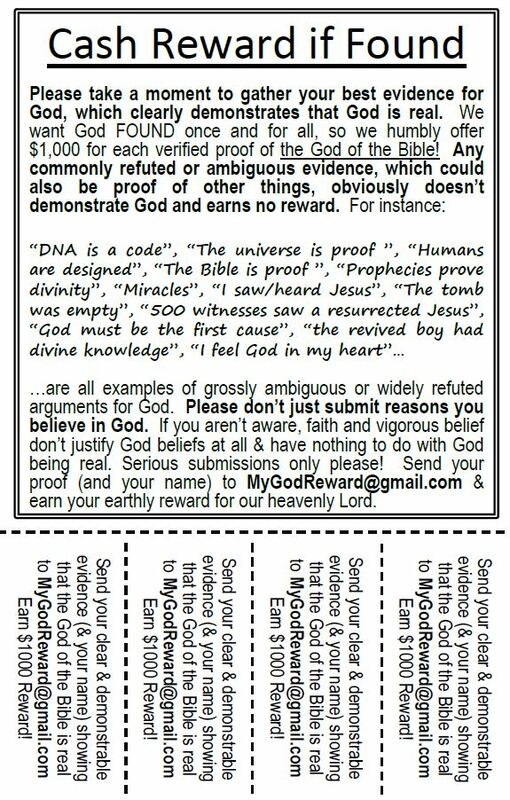 // Do You Teach Your Children to Seek the Truth (Mini-pamphlet) Be the role model of intellectual integrity for children, so they learn to seek truth like you do. 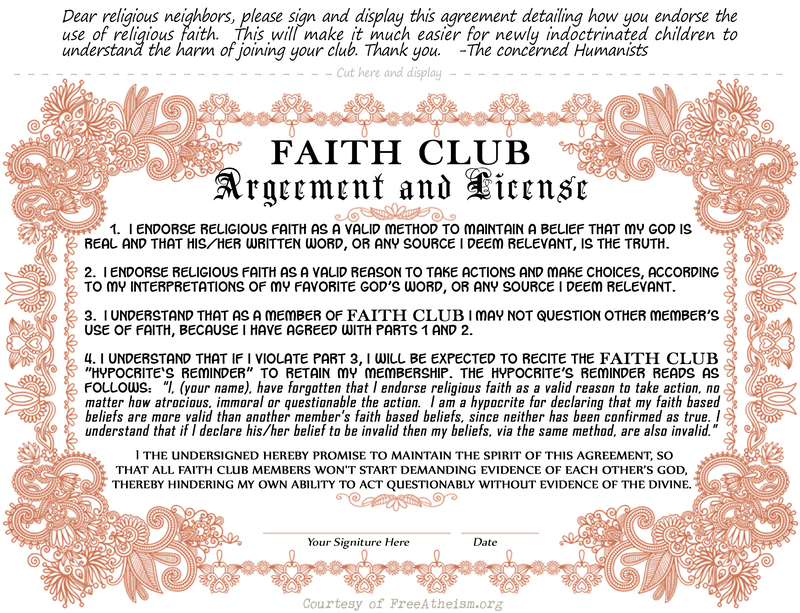 Agreement & Licence to use Religious Faith freely & without regulation (pic) … This is a certificate style agreement which explains the harms of endorsing and allowing unregulated faith, instead of challenging the religious for validity of their actions. 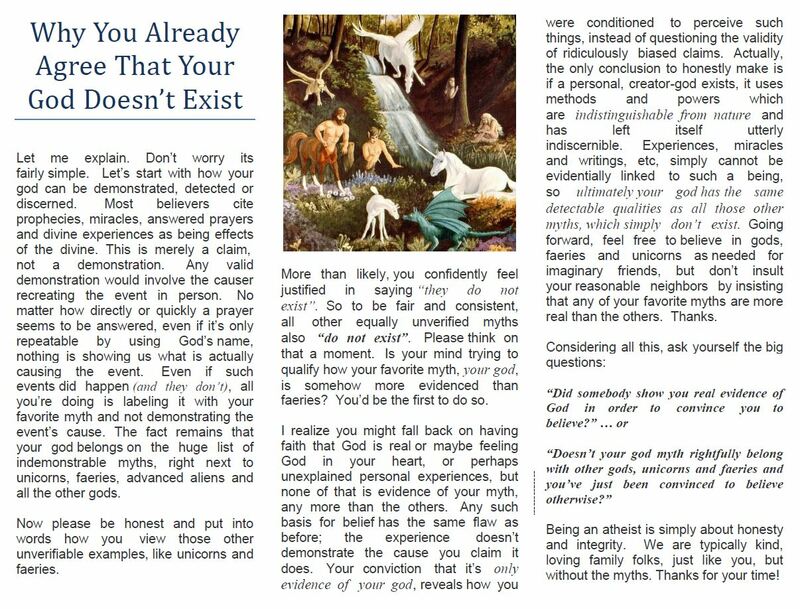 Why You Already Agree That Your God Doesn’t Exist (pic) ,… A full page (accordion style) flier which explains to readers how their God is equally indemonstrable as with all other myths, which they know don’t exist. 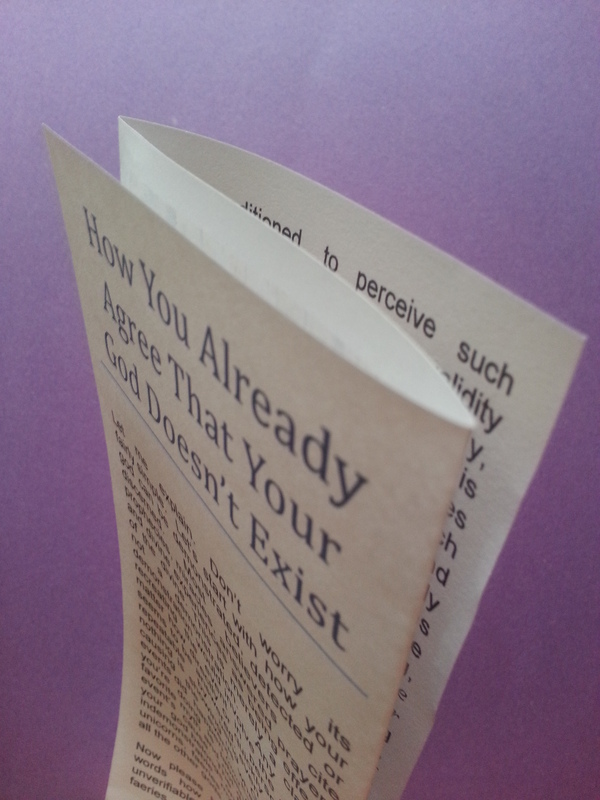 A Reminder to Think A simple half page flier with tear off tabs to remind people its OK to think. Post Everywhere! 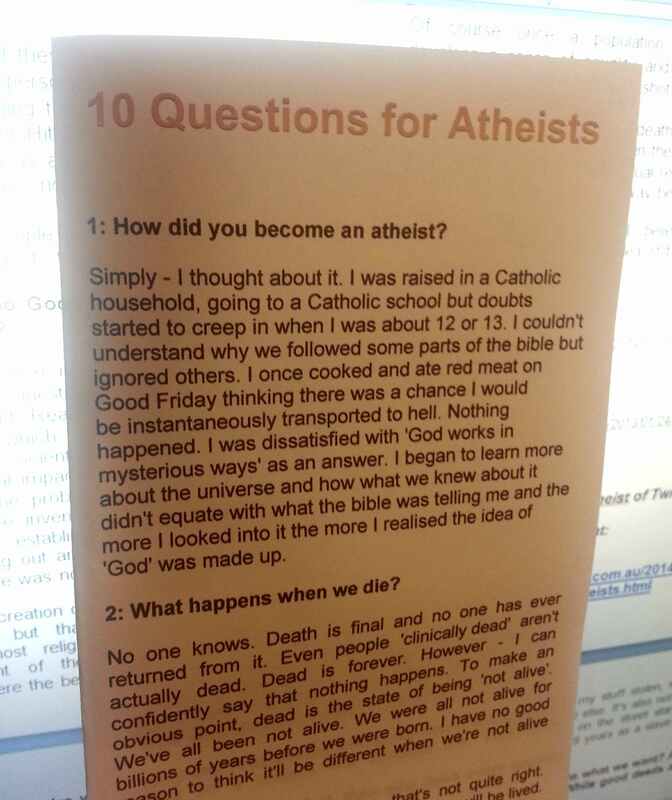 Multiple Atheism pamphlets >> What is Atheism , (French, German, Spanish) // Evolution in a Nutshell, (French) // Scientific Method and the Burden of Proof, (French) // This I Believe, (mini-poster) // For more pamphlets, mini-posters and some direction of use at Cyberguy’s Atheist Resources Page. 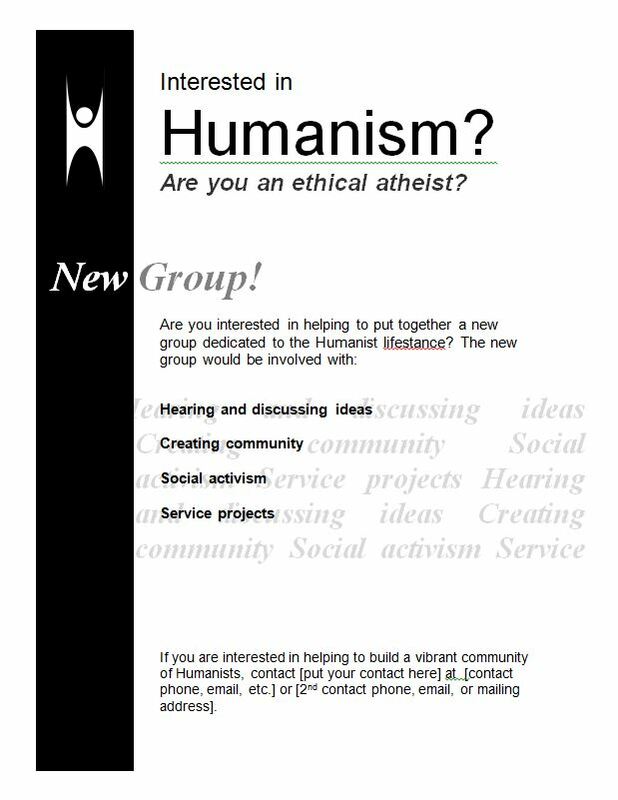 More to come… please submit your Paper Tweets at FreeAtheism@gmail.com they can be word type files or Pic files. 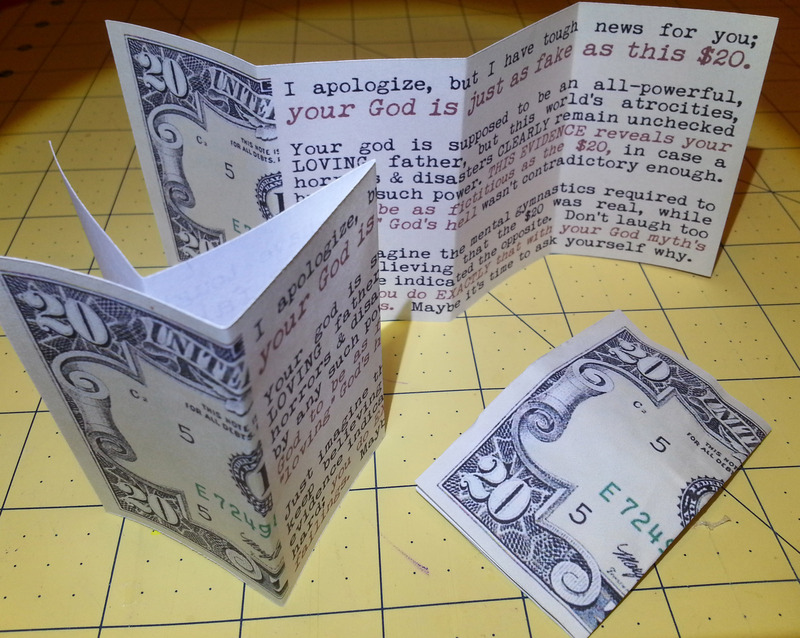 It’s a bit less confrontational and might be more suitable for handing out. Not a fan of the fake twenty dollar bills. 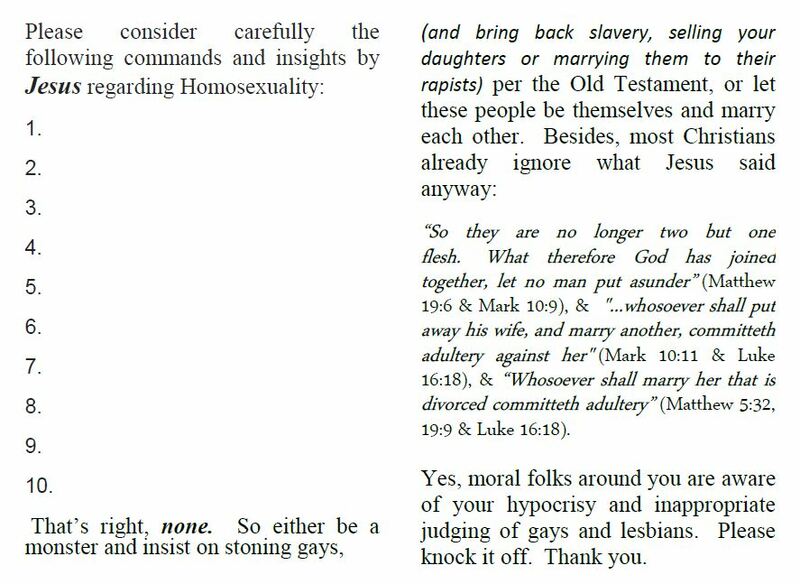 Ray Comfort’s church pulls the same tactics, along with believers who use them to “tip” waiters & waitresses who rely on tips to live. Thanks! I haven’t updated my site in a while aside from new blogs and challenges. 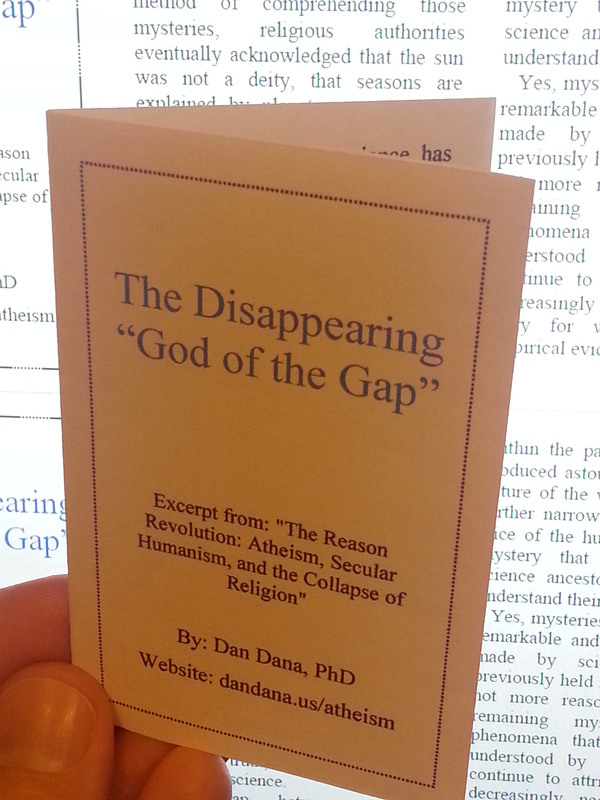 i see you have a lot of tracts that refute the Christian faith only and I was under the impressions that atheists reject all notions of religion and don’t believe there is a God. 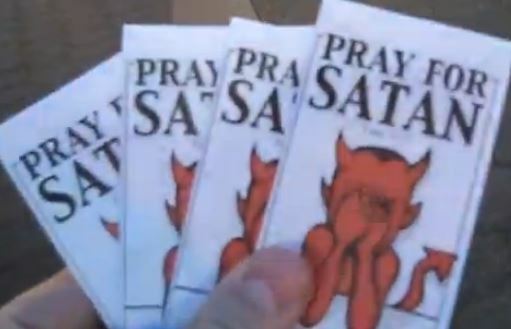 So what I am asking is where are the tracts that a geared towards people of the faiths of Islam, Buddhism , Judaism, Hinduism etc? 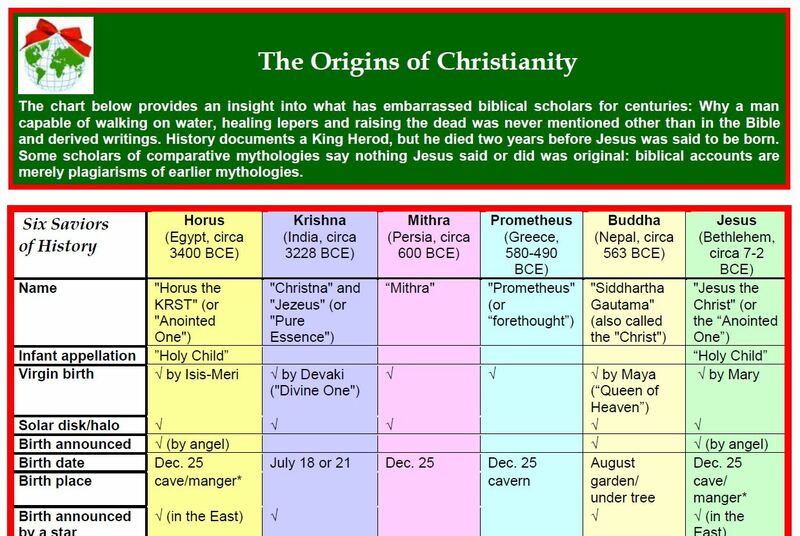 Why only the Christian faith? Why not go against all faiths. 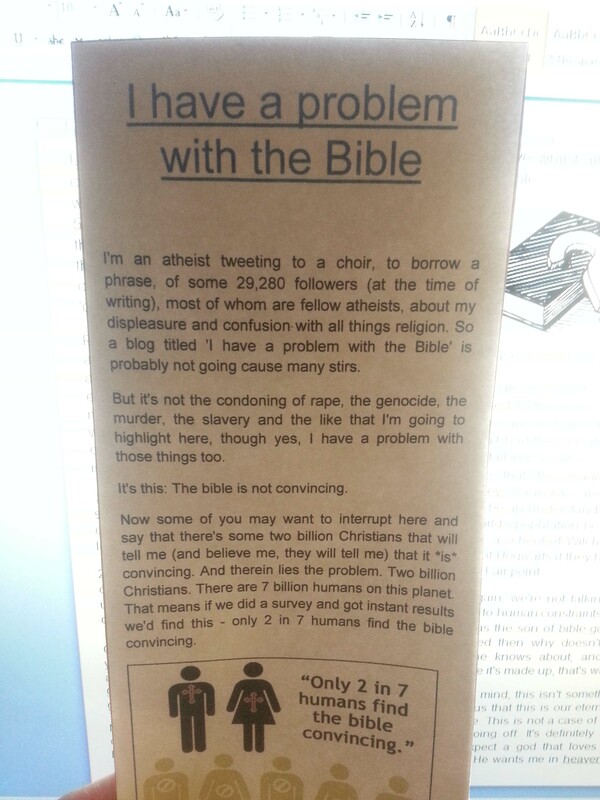 Why do atheist go only against the Christian faith and the bible, why not the Quran? I’m assuming atheists only reject Jesus Christ then and believe in other gods because I never see an atheist go against any other religion. 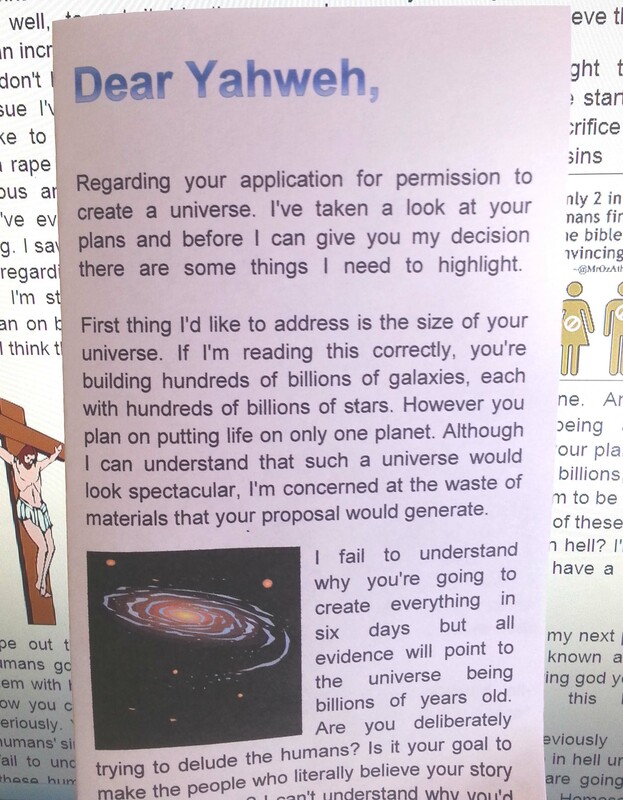 If I’m not correct and atheist go against all religions and the idea of a God then I ask why not publish material against all the religions to pass out. 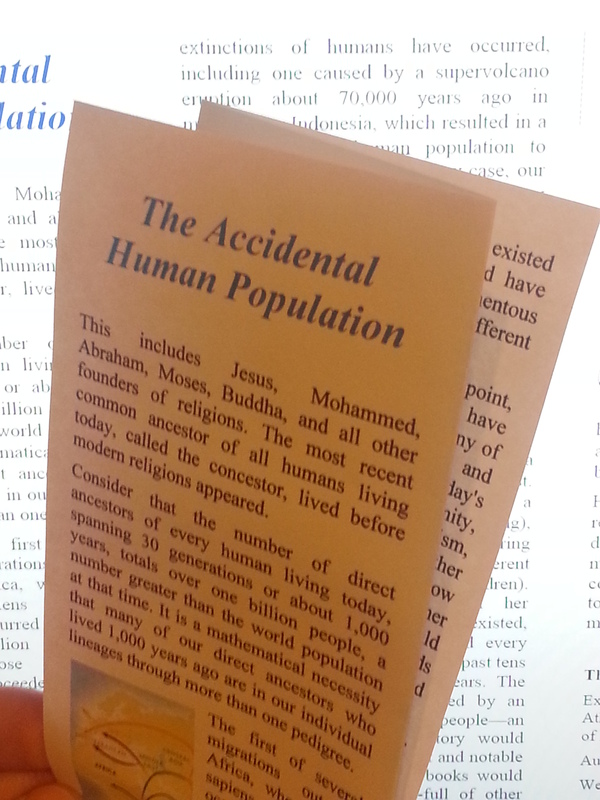 The majority of people in the world are Muslim now so your missing a huge percentage of people. It’s probably just because Christianity is the dominant religion in your country. Plus Muslims and Hindus tend to have either very high or very low concentrations in countries: most are concentrated in the Middle East or India, while outside that area the percentage drops sharply. One thing Christianity has going for it is that has spread all over and many countries have a medium percentage of Christians. Probably due to Christianity’s lack of a strong attachment to any one race or nation.